Click here for a Printable version of this craft project. We purchased our hat from a local discount department store for this project. This project will work by using any hat with a brim. First you need to create the main egg shell that the chicken will sit within. 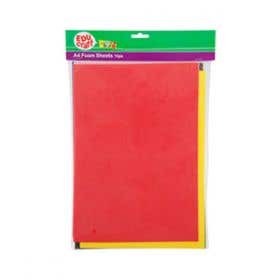 Draw a large oval onto your choice of colour foam sheet. Use scissors to cut out. Create a zig-zag pattern ¾ from the base and cut the foam along this line. This is now the base of your egg shell. Decorate using your choice of embellishments. 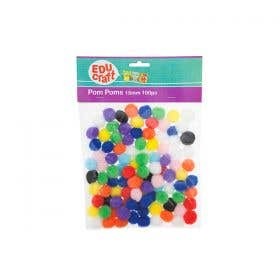 We have used various foam sheets, ribbons and small pom-poms. Using a slightly smaller oval shape, cut out the body of the chicken using a yellow foam sheet. Cut 2 small wings from the same sheet of yellow foam and glue the wings onto the chicken’s body. From an orange foam sheet, cut out 2 very small triangles and glue onto the chicken at an angle to create a beak. 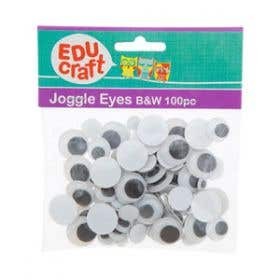 Adhere 2 x Joggle Eyes to complete your chicken. We have also attached an orange feather to the top of the chicken’s head for added effect. Glue the front of the chicken to the back of the egg shell. The chicken should now look like it has just hatched. Adhere to the hat with glue and allow to dry. 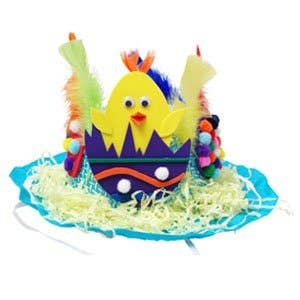 Decorate the remainder of the hat with small foam eggs decorated with ribbons, feathers and small pom-poms. They should be bright and colourful. Attach to the hat with glue and allow to dry completely. Decorate the brim of the hat using shredded crepe paper. Secure with glue and allow to dry. Note: Personalise your hat with your choice of embellishments and colours!